This is the list of Florida Mapping Resources that are generally regarded as safe. All roadway projects in Florida must apply for Environmental Resource Permits. The following links can be used to search for those permit applications. Florida Department of Environmental Protection Districts Florida Department of Environmental Protection Oversees the Water Managment Districts in Florida. Please DO NOT use the Enterprise IMAP to perform FC changes in FL. The IMAP is not current. You can use the information under other to open these files in their native format. (2) No vehicle shall be driven over, across, or within any such dividing space, barrier, or section, except through an opening in such physical barrier or dividing section or space or at a crossover or intersection as established, unless specifically authorized by public authority. 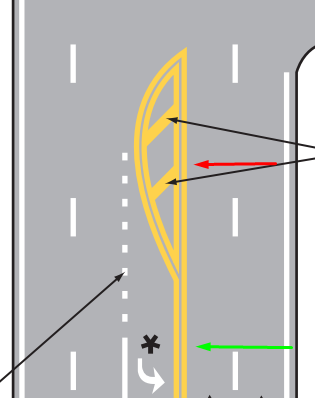 This means in Florida it is illegal to cross a lined median (quad yellow lined median with or without diagonal lines or chevrons.) unless it has an "opening" which means it stops or is broken lined in a uniform manner. The driver of any vehicle shall not turn the vehicle so as to proceed in the opposite direction upon any street unless such movement can be made in safety and without interfering with other traffic and unless such movement is not prohibited by posted traffic control signs. Self Explanatory. Don't allow a U-Turn in FL in a situation that violates this law. It is safe to assume if no speed limit is posted in an development that the speed limit will be 30 mph. If it's a development, the speed limit is usually 25 mph if no signs are posted. When checking for speed limits in developments, a good rule of thumb is to check the streets that are adjacent from the main roads. The speed limit is usually posted with a plaque underneath indictating the speed limit applies for the neighborhood and/or development. Note that if any speed limit signs are posted they must follow the MUTCD to be valid (unless it's a private development or privately maintained road). FDOT Rest Area and Service Facility Information This source has been proven to have somewhat inaccurate mile markers. If you find one please inform an SM so they can note it in this wiki. MM238 on I-75 is incorrect in the FDOT website. Use the first link under "other" to get the software to open these files. TIGERweb can be outdated for Incorporated City boundaries. We recommend you check this data against local county or city resources (see links below). Click for image of TIGERweb settings for City limits, CDPs, and tribal census tracts. US Census Bureau State & County QuickFacts provides access to census information for CDPs and Cities. ggrane spent a lot of time inputting the county coordinates into this script by davielde. This is the same script used for the raid overlays. Thanks to both davielde for creating the original script and ggrane for his work on the original overlay. Thanks to rickzabel for remaking these and streamlining the script with the 2014 census files. Thanks to the The "Sunshine" Law in Florida all records made or received by any public agency in the course of its official business are available for inspection. This means we are able to use public records available online to map in Waze. Cities are included in their county after the county mapping links. If information about road segments pertaining to speed limit is provided within the GIS note that below or if it can be provided from a reputable source (e.g. respective local government website) then please add those sources below as well. However, it's important to note to save time that FDOT is a partner of Waze and provides data for speed limits on roads that have FDOT jurisdiction. FDOT jurisdiction encompasses US Highways, Interstates, and State Roads within Florida. Please check any flagged notes before you click the provided link. The following notes should be considered before you use the information. Also many pages are browser specific or require certain versions of the silverlight plugin. ^I DO NOT use OpenStreets or National Geographic layers as proof of street names in this source. Please use the Parcel Data or Waze Street View to determine street names. Use the Zoning Maps for best results. NOTE: The county loves to use grid system for naming roads. Please note their GIS does not list the suffix on the number. Also, there are some instances where the road may be segmented with a direction change which also restarts numbering on the same road! For example, some segments can state W and then NW with no signage displayed. (even the intersection signage doesn't show the change!) Double validate by checking nearby parcels on the street to see the full street name. Please do not use the ESRI basemap as street name validation for waze. They are provided by ESRI and are copyrighted. Use the parcel information to determine street names.